Hawaii regulators have rejected plans for a broad expansion of smart grid electric technology that would have been paid for by residents and bus- inesses. Asso- ciated Press. 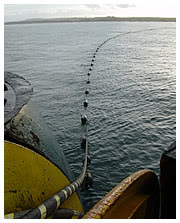 When it comes to repairing a severed fiber-optic cable 3,000 feet under the sea, it won't be as simple as calling the cable guy. Star-Advertiser. Internet, cable television and telephone service began returning to normal Tuesday afternoon for thousands of Oceanic Time Warner Cable customers after a break in an undersea fiber-optic cable disrupted service about 12 hours earlier. Maui News. A rare break in an undersea fiber-optic cable Tuesday morning, left around 400,000 people without Internet, phone and TV service, for 12 hours in some cases. Hawaii News Now. Oahu resident Ian Kurihara discovered early Tuesday morning he wasn't able to go online. KITV. A wind farm on Oahu's North Shore is receiving a big boost in federal funding. KHON2. Chemical weapons dumped off Pearl Harbor after World War II pose no threat to humans for now but are "clearly deteriorating" and should continue to be monitored, the lead scientist on the University of Hawaii project said Tuesday. Associated Press. They're safe for now. There's no threat to humans or the ocean so far. Hawaii News Now. The Hawaii Women Lawyers will be expressing their strong support of Gov. 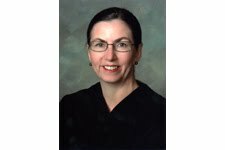 Linda Lingle's appoint- ment of appeals Judge Katherine Leonard as the next chief justice, a spokeswoman for the group said yesterday. Star-Advertiser. In a letter to the Hawaii Bar Association, attorney Eric Seitz calls Katherine Leonard "ill equipped and unqualified" to be Hawaii's next Chief Justice. Hawaii News Now. After failing at its first bid for federal Race to the Top funds, Hawaii has placed among 19 finalists with its second application for one of the coveted education grants. Civil Beat. A West Hawaii ranch owner says a local business owner who bought part of Hokukano Ranch is cutting down old-growth sandalwood in the upper reaches of the property. West Hawaii Today. Recreational off-road vehicles have damaged much of the terrain at Kaena Point. KHON2. A city contractor working on a 42-inch main that broke late last week in Pearl City accidentally severed the 30-inch backup force main near the 14th hole of the Ted Makalena Golf Course, causing a spill of about 108,000 gallons of sewage yesterday. Star-Advertiser. Officials posted signs warning of a sewage spill are being posted along the Pearl Harbor bike path and at Middle Loch. KITV. Hawaii County property taxes are leaving the state this year. But don't worry, say county administrators, the money will come back. West Hawaii Today. Hawaii's "Sunshine Law" is hampering the County Council and should be overturned, says North Kona Councilman Kelly Greenwell. Tribune-Herald. A forum on the topic of “In Search of Real Security for Kaua‘i” will include remarks by Congresswoman Mazie Hirono, D-2nd District. Garden Island. Local divers will be competing in a tournament targeting invasive fish. The "Westside Roi Reckoning" takes place Saturday off Kahe Point. Hawaii News Now.